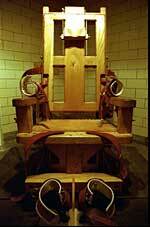 Yellow Mama is the nickname given to U.S. state of Alabama's electric chair. Yellow Mama is now stored in an attic above the newly reconstructed execution chamber at the Holman Correctional Facility in Atmore, Alabama. The last execution to occur using it was that of Lynda Lyon Block on May 10, 2002. Following her execution, a bill was passed that would allow for execution by either lethal injection or electrocution. "Yellow Mama" was also the title of a story written by Cindy Rosmus about a very bad man and a bright yellow Camaro...you can find that one in our Archives.